Claude Debussy (1862-1918) is a name that probably evokes for the majority of people the piece of music called Clair de lune, originally written for solo piano then orchestrated by others. What piano student at one time or another has not tried their hand at the filigree passages of this quintessential example of impressionism? It is amusing to think of the delicacy of touch necessary to give justice to the gossamer arpeggios of this dreamy wash of audio colour by those who may have been better suited to "pounding out" the less dainty syncopation of ragtime as heard in Scott Joplin's The Entertainer. However the uninitiated listener is more than likely unaware that Clair de lune is merely one of four piano pieces which make up what is known as Suite Bergamasque. These other three undiscovered gems further demonstrate Debussy as a composer of major repute in the impressionist movement. This is the type of music best suited to a Sunday afternoon of quiet reflection, possibly curled up on the sofa with a good book. Whatever the setting, this is the type of music that you don't necessarily listen to, it is music you feel. It is music you let sweep over you as an aural massage. You let it transport you to a realm of peaceful meditation. ... Wow, am I waxing poetic or what? A long time ago, in a galaxy far, far away (You know it's going to be good if I start by quoting Star wars), I had the fanciful idea of studying music. Okay, doesn't everybody go through a phase when they want to be some artistic type before settling down with the usual: some sort of education, a job, and possibly that white picket fence in suburbia? At one point during my short-lived career as a musician, I had the privilege of playing the Suite Bergamasque. Yes, I played Clair de lune as part of my studies but I heard the suite and loved it so much, I decided to learn all four pieces. I gave up playing the piano in 1978. During the past thirty plus years, the condition in my left hand has gotten progressively worse. I used to be able to type with all ten fingers, an important skill to have in the world of computers, however today I can only use my index finger and my thumb in my left hand having pretty much lost all control of the rest of my fingers. If I move slowly, I can wiggle my fingers but if I speed up, my entire hand tenses up and sometimes it tenses up so badly it hurts. If you watch me type, I use all five fingers with the right hand and two, possibly three fingers on my left hand. Keith Emerson, the keyboardist with the group ELP was diagnosed with the problem several years ago and I have seen video clips of him playing and it is obvious he is fighting the condition. Classical guitarist Liona Boyd has given up her career. The Wikipedia article on Focal Dystonia lists numerous people in various areas of music including classical, rock and folk affected by this bizarre condition. That same article points out that this condition most typically affects those who rely on fine motor skills—musicians, writers, surgeons, etc. It is generally "task specific," meaning that it is only problematic during certain activities. Life is funny and all of us have our own story. After I quit music, I decided to undergo some professional career testing to get an idea of what else in life may have been suitable to me. I remember taking this oddball test (I think it was based on the Minnesota Multiphasic Personality Inventory) which asked a series of strange multiple choice questions. What would you rather do: eat a peanut butter and jelly sandwich or climb Mount Everest? What the heck? The results of all this gave me a report on various activities I would be interested in. Number one on the list? Music. Ah, the cruel irony of it all. Ha! I cried because I had no shoes then I met a man who had no feet. Life is good. Well, life can be good if we somehow get a hold of ourselves and make it good. As I've said elsewhere many a time, the sun is going to come up in the morning whether I like it or not. Yes, I may curse the dawn but the sooner I accept that I can't do anything about the sun coming up, the sooner I can move on to things I can do something about. (You can recite the Serenity Prayer here.) Is the glass half full or is the glass half empty? It's all very Zen-like. Of course some smartass just had to stir things up by telling me that the problem is not that the glass is half full or half empty; the problem is that the glass is twice as big as it should be. It's at this point I roll my eyes, shake my head and say, "Oh brother!" 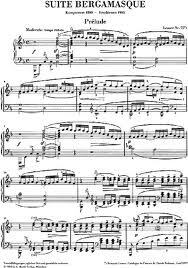 The Suite Bergamasque is one of the most famous piano suites by Claude Debussy. Debussy commenced the suite in 1890 at age 28, but he did not finish or publish it until 1905. Claude-Achille Debussy (22 August 1862 – 25 March 1918) was a French composer. Along with Maurice Ravel, he was one of the most prominent figures working within the field of impressionist music, though he himself intensely disliked the term when applied to his compositions. Debussy is among the most important of all French composers, and a central figure in European music of the turn of the 20th century. He was made Chevalier of the Legion of Honour in 1903. His music is noted for its sensory component and for not often forming around one key or pitch. Often Debussy's work reflected the activities or turbulence in his own life. His music virtually defines the transition from late-Romantic music to 20th century modernist music. In French literary circles, the style of this period was known as symbolism, a movement that directly inspired Debussy both as a composer and as an active cultural participant. Impressionism in music was a tendency in European classical music, mainly in France, which appeared in the late nineteenth century and continued into the middle of the twentieth century. Similarly to its precursor in the visual arts, musical impressionism focuses on a suggestion and an atmosphere rather than on a strong emotion or the depiction of a story as in program music. Musical impressionism occurred as a reaction to the excesses of the Romantic era. While this era was characterized by a dramatic use of the major and minor scale systems, impressionist music was tending to make more use of dissonance. Rather uncommon scales such as whole tone scale are also typical for this movement. Romantic composers were using long forms of music, e.g. symphony and concerto, while impressionist composers were favoring short forms such as nocturne, arabesque and prelude. Each film in the Star Wars series opens with a crawl (also known as a roll-up) of text which provides an explanation of the backstory and context of the film. The crawl has become associated with the films and has frequently been parodied. Focal dystonia is a neurological condition that affects a muscle or group of muscles in a part of the body and causes an involuntary muscular contraction or twisting. For example, in focal hand dystonia, the fingers either curl into the palm or extend outward without control. The Minnesota Multiphasic Personality Inventory (MMPI) is one of the most frequently used personality tests in mental health. The test is used by trained professionals to assist in identifying personality structure and psychopathology. my blog: Passion: Can you live without it? Then again do you want to live without it? - I have been blessed a few times in my life to have experienced true passion. However I am certain you may think I'm talking about something romantic but what I am actually talking about is passion for what you do. To live passionately, to work passionately; this is about the passion you have or should have about your personal goals in life, about your life itself. my blog: Alcoholism: I'll drink to that! On February 8, 2011, I will mark 23 years of sobriety. Yes, I am an alcoholic. Certainly the word must evoke all sorts of images from the drunken lout at the office Christmas party to the lost soul out on the street sleeping on a grate to keep warm during the winter. Reflecting on my own acquaintance with various parts of the spectrum of extremist behaviour, I can say, "Been there, done that" and I can add that I have a great deal of both compassion and respect for those who fight the good fight. my blog: Focal Dystonia: focal what? This scientific term which I admit is a bit of a mouthful, refers to a phenomenon where one loses control of the individual fingers. From what I've read, this condition seems to strike for the most part musicians who may be more susceptible than others to repetitive stress syndrome. Due to the nature of a musician's use of the fingers, these digits undergo a type of stress which may in the end, render the musician incapable of using his or her fingers.